In April of 1912, the RMS Titanic set sail on its way to New York City, and it was one of the biggest ocean liners of its time. It hit an iceberg, and unfortunately, there were only 20 lifeboats on its maiden voyage, which was not enough to save everyone on board. More than 1,500 people died, and the survivors witnessed the boat sink. More than 100 years later, people are still fascinated by the tragedy, and it inspired what is now considered to be one of the most tragic romance movies of all-time. Just like every major tragedy talked about around the world, people begin to speculate that there my be more to the story – some secret reasons why the ship really sank, as if a massive iceberg isn’t enough. Here are 10 conspiracy theories about the Titanic. When the White Star Line created the Titanic and its sister ships Britannic and Olympic, they were all designed by ship builders Harland & Wolff from Belfast. In their designs, the ships were created so that 16 separate watertight compartments could flood with ocean water and still remain afloat. According to some theorists, they believe that these watertight doors did more harm than good. Some people believe that if it were not for the doors, the ship may have filled up with water evenly underneath the entire ship, instead of just one side. The idea is that it may have bought the passengers enough extra time to escape. Keep in mind that these doors are the reason why the front of the boat dipped into the water after it hit the iceberg. These same people claim that if the water was more evenly distributed, it may have bought the passengers an additional 30 minutes of time to escape. However, the Discovery Channel tested this theory with a simulation in a documentary in 1998 called Titanic: Secrets Revealed. They concluded that if it were not for the watertight doors, the ship would have sank much sooner. Historian Parks Stephenson explains that in a wooden boat, evenly distributing the water would make sense. But, since Titanic was a steel ship, the watertight doors did, in fact, keep it afloat for at least 30 minutes longer than it would have otherwise. Some theorists believe that a fire was burning near the hull of the Titanic for as long as three weeks before its maiden voyage. A documentary by Channel 4 in the United Kingdom called Titanic: The New Evidence digs into the theory that the boat sank because of fire, rather than ice. The fire would have weakened the steel of the ship, and made it easy for an iceberg to tear through the side. This theory comes from photographs of the ship before it set sail, where black marks can be seen. Some people theorize that this is a burn mark of a fire that would have been invisible to the passengers. This theory originated in an article from the New York Tribune, which claimed that the fire began while the boat was docked in Southampton, England. However, just after the boat sank, people were going wild with their own conspiracy theories. While the documentary uses the evidence that has been around for years, there really has not been any new discovery that would support this theory. It’s entirely possible, but most would agree that regardless of whether the fire was going or not, the iceberg would have still done its damage. This is yet another theory that tries to put the blame on the designers of the Titanic. There were expansion joints at the bottom of the ship, which some theorists believe would have broken the Titanic during any rough storm, and it wouldn’t have taken something like a massive iceberg to take it down. A researcher for the History Channel named Rushmore DeNooyer believes that the bottom of the ship did not flood at all – that the snapping expansion joints are what caused the boat to break apart. The only proof that DeNooyer has about this idea is that one of the White Star Liners that was built later – the HMHS Britannic – had more expansion joints installed as a safety precaution. However, considering just how many boats belonging to White Star Liner were destroyed, it would be even more shocking if they didn’t make any improvements to the designs. To top it off, the Britannic sank as well, in 1914. If you thought you were going to get through a conspiracy theory list without hearing about aliens, think again! According to a tabloid called Weekly World News, they have so-called evidence that a UFO shot lasers at the Titanic. A scientists named Dr. Josef Hostettler claims that they discovered three large holes underneath the ship, which they conclude could have only come from an attack by an underwater alien spacecraft. They also claim that nearby ships lost radio contact with the Titanic, which is why more rescue boats were not able to show up to help rescue the survivors. Of course, there is very little evidence to back up this theory, but as with most alien theorists, it all comes down to what you believe exists, and what you don’t. Yet another supernatural theory claims that time travelers sank the Titanic. Of course, he was joking, but there are people out there who truly do believe in this theory. A website called Stranger Dimensions took this theory a bit further with their own spin on the idea, saying that the time travelers weren’t tourists, but spies paid by J.P. Morgan to sabotage the ship to collide with the iceberg, in order to claim the insurance money. Financier J.P. Morgan was the owner of White Star Line, and he had invested a significant amount of money into the Titanic. Before setting sail, he was working on a plan to create the American Federal Reserve to regulate the banking system. There were some outspoken critics of Morgan’s ideas, and all of them had originally booked a trips on the ship. Their names were Benjamin Guggenheim, Isa Strauss, and David Astor. Morgan and some of his closest friends canceled their trip on the Titanic at the last minute, and survived. His opponents were all on board the Titanic… and perished during the sinking of the ship. The Federal Reserve was created the very next year, in 1913. All of that is true. But is it a coincidence, or something much darker? There is so much more to this theory, it could be its own article. It involves the Rothschild family, and even the Illuminati. However, if we sum it all up, the idea is that evil bankers wanted control over the U.S. economy so badly they were willing to stage a wreck killing more than a thousand people in order to take out a handful of men. If this is true, many members of the crew, including the captain, would have had to be involved. They would have had to be okay with the plan, and willing to give their lives toward the cause. In 1915, just three years after the sinking of the Titanic, the RMS Lusitania was attacked by a German submarine and sank. Considering that both boats were made by the same company, and they were comparable sizes and built with similar materials, conspiracy theorists have argued that the Titanic may have been hit by a German submarine as well. A conspiracy theorist named Dr. Franklin Ruehl talked about this idea on a TV series called Mysteries From Beyond The Other Dominion, and again for the Huffington Post. Apparently, survivors heard sounds of explosions on the ship. There were also lights from a ship seen in the distance, which survivors attributed to a ship called the Californian. However, as Dr. Ruehl claims, the Californian saw lights in the distance as well. This has caused a theory that a third ship – in this case, a German U-boat – would have been there, and slipped underneath the water, never to be seen again. However, World War I did not begin until 1914. The Titanic sank in 1912, so there would be no reason for Germany to attack the ship at that time. In his article, the only sources Dr. Ruehl links to this theory are his own videos, as well as psychic premonitions people had before the crash. In 1889, the British Museum acquired an egyptian artifact known as “The Unlucky Mummy,” due to the fact that its previous owners had some serious bad luck. While this is all true, the conspiracy begins when some believe that the new owner of the mummy was trying to board the Titanic in 1912. The same curse that brought misfortune to all of the other owners is to blame for the Titanic sinking. Of course, this theory has several holes in it. For one, you would have to believe in the mummy’s curse. Secondly, there is no evidence ever showing that the mummy was actually on board the ship. And if it truly was on the ship, the likelihood that someone would have prioritized an artifact to take up space on a lifeboat in place of other human beings is also pretty ridiculous. The mummy is still on display at the British Museum today, if you wanted to visit it someday. A publication from 1987 claimed that on the hull of the Titanic, there were the numbers 3909 04. When seen in a mirror, the numbers appear to be the words “No Pope.” The construction of the White Star Liner ships were completed in Belfast. As the story goes, many of the shipyard workers were Catholic, and they saw this as a bad omen that God would not be protecting this ship, and it was truly doomed to sink. 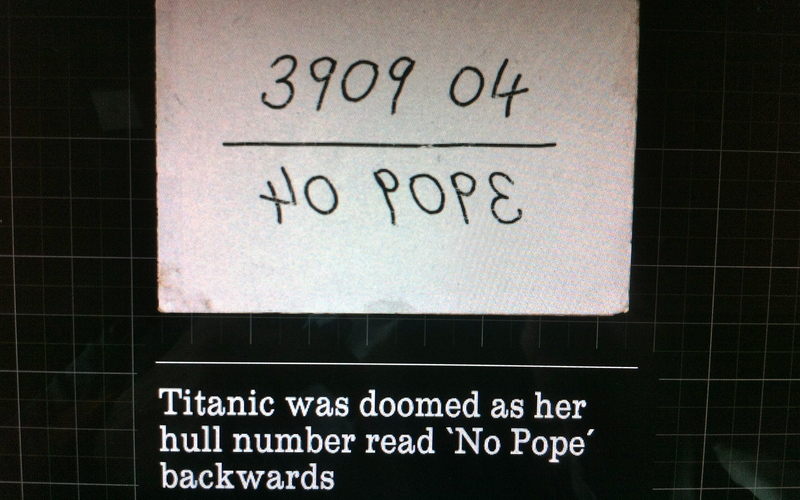 Snopes investigated this story, and discovered that the number on Titanic’s hull was actually 131,428. Not only is the number wrong, but the vast majority of shipyard workers were actually Protestant, not Catholic. Even if the story had been true, one would have to believe in the supernatural for this conspiracy theory to hold any weight. The oldest and the most well-known and widespread conspiracy Titanic conspiracy of them all is that the White Star Line switched out the Titanic for its sister-ship, the Olympic. The RMS Olympic was the first of the massive ocean liners, but unfortunately, it collided with another ship, and became very damaged. Edward Smith, the captain of the Olympic was to blame for the accident, and White Star Liner did not get any money from their insurance to pay for the repairs. Smith became the captain of the Titanic as well, and he went down with the ship. Some theorists believe that the Olympic was quickly repaired with parts from the Titanic, and set sail in the Titanic’s place. Considering that the two ships look almost identical (that’s the Olympic above, by the way), people believe this must have been an easy switch. When it sank again, White Star Liner was able to take back millions of dollars from the insurance claim. However, in a documentary done by Sky, it was revealed that dives from the wreckage of the Titanic found steel parts stamped with number “401,” which were all original Titanic parts. If it were actually the Olympic, as this theory claims, there would be at least some remnants of parts labeled with its serial number “400,” and yet there are none. This proves that the ship that sank was, in fact, the Titanic. Not only that, but there were roughly 15,000 Irish men working on these ships. The sheer number of people means that the likelihood all of them could have kept the White Star Liner’s secret is slim to none… especially after having a few pints in the pub.